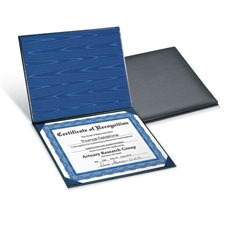 Deluxe folders make your employees feel like VIPs! Each of these simulated leather folders features rich, cushioned padding and blue silky moiré lining for a truly influential and superior presentation. Appropriate for any occasion when you want to project an impression of importance. Size: 11 1/2" x 9"